The ADJ Par ZP120 RGBW is a modern LED twist to the traditional halogen par can. It has a silver polish exterior housing and is powered by a potent 115W quad C.O.B. LED (Chip On Board) LED with red, green, blue & white colors. Its output is comparable to a 1000W halogen sealed beam par. It is equipped with 5 different beam angle options that may be changed by hand. powerCON In/Out allows for the fixture to be daisy chained, while 5-pin DMX control offers a variable strobe rate and 5 different dimming curve options. 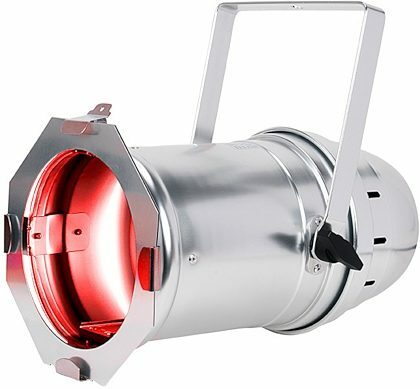 The Par ZP120 RGBW allows lighting and stage designers the look of the traditional stage par with the technological conveniences of modern day lighting. The advantages include low power draw, fixture and performers won't get hot on stage, DMX control of dimming and strobe. There are no dimmer controllers need. The fixture comes with a gel frame in which diffusion filters may be inserted to further change the beam angle. zZounds is an authorized dealer of ADJ products. - Life expectancy: rated at 50,000 hrs.